Food Glorious Food, Simon Cowell’s new food competition show, will be filming it’s semi-final on Sunday. The show’s goal is to find food suitable for marketing through Marks and Spencer. The show features some great, well-known judges and is full of fun and, yes, food! 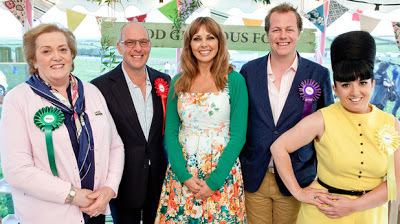 Back in 2012 my friend Liz and I were invited to be part of ITV’s new food programme ‘Food Glorious Food’ as WI food judges. We attended the recording of the semi-final at the beautiful Ashridge Estate in Hertfordshire on a lazy Sunday with (rare) glorious British weather. The programme is the brain-child of Simon Cowell and is a cookery competition for the great British public – looking for a dish that is suitable for being made and sold en-masse in Marks and Spencer. The entries were initially judged by globe-trotting gastronome Lloyd Grossman, food writer and Historian Tom Parker Bowles, self-taught baker extrordinaire Stacie Stewart and WI top brass Anne Harrison. Each judge handed out rosettes to the dishes they felt most delighted their senses and captured their imaginations, and then chose one dish from each show as a regional winner. Food Glorious Food is a new public contest reality show by Simon Cowell. How do you think it will fare? Will you be tuning in or tuning out? With all the competition show experience Simon has, Food Glorious Food is a real winner.